Yesterday, great excitement. I got my knives sharpened! It is a metaphor for how my life is going. I have this surge going with my book and I get my knives sharpened. I went over last night to my friends' Mike and Melinda's house with my knives and a bottle of wine and Mike sharpened my knives. And we all drank the wine. This did not all happen at the same time or else I probably would not be here writing this. It is thrilling to have sharp knives. Mike was laughing because I have not sharpened these knives in forever. They are Henckel knives and they were a wedding present from my Aunt Marce and Uncle James. 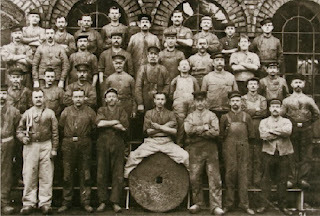 Above is a picture from World Knives of the Henckel knife making team from 1903, in Solingen, Germany. Those are the folks who made my knives! I treasure them. But for a long time I have not sharpened them. Mike said the big knife had no edge at all!, zut alors and son of a garlic-chopping sea cook. Anyway, he and Melinda wrapped my sharp knives in a dish towel for me and home I went with them. I got home kind of late and Howard and I ate dinner even later because I could not stop chopping and dicing things. Chopping an onion was a pleasure! "Be careful!" Howard said. "You're going to cut your fingers off." "Howard," I lectured. "I have read all about this and it is the dull knives that cut you. When your knives are sharp it's much safer. You don't cut yourself --"
Howard is right. His name means "noble watchman," remember? And so I am careful. But still I am enjoying these knives. This morning between polishing up my incisive assessments of two Pennario albums I went and shredded a cabbage. The Henckel went through it like butter. What a joy. My brother-in-law David is going to be really happy I did this, too, I will tell you that. Because it is his job to carve the Thanksgiving turkey and I am always handing him dull knives. No more! It's the little things that make your life a cut above! Thanks, Protech Knives! I will keep you in mind.